LIVERPOOL fans down under are invited to join Fox Sports’ Dan Garb and The Times Football Editor Tony Evans as The Anfield Wrap brings its award-winning podcast and radio show to Melbourne in association with Liverpool Sound City. 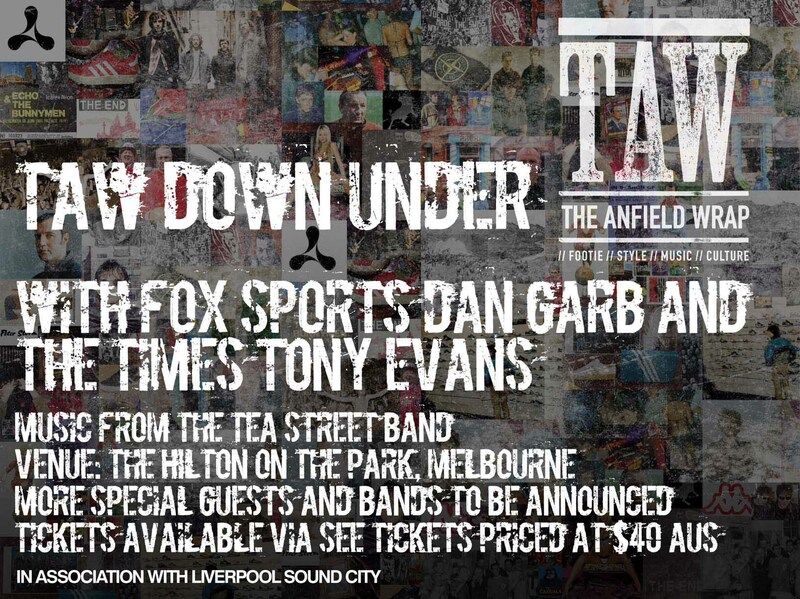 Dan and Tony will join the TAW lads to talk football as Liverpool FC head to Australia as part of their 2013 pre-season tour. The Reds are playing at Melbourne Cricket Ground – The Anfield Wrap are playing across the road at The Hilton on The Park. The night, on 23rd July 2013, will also see a set from Liverpool-based rock and roll dance combo The Tea Street Band with more special guests and bands to be announced. Tickets, priced at $40 AUS, are available now and exclusively from See Tickets. The Anfield Wrap was launched in August 2011 by a group of fans and has since gone on to become the most-popular Liverpool FC podcast, downloaded by around 30,000 supporters every week with total download figures now well past two million. It was crowned the Football Supporters’ Federation Podcast of the Year and is now also a weekly show on Liverpool-based radio station City Talk 105.9. 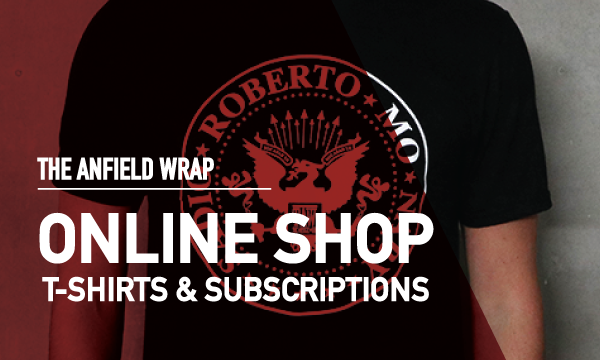 Earlier this year The Anfield Wrap digital magazine was launched, an interactive publication designed specifically for handheld digital devices. TAW Co-founder Jim Boardman said: “To be told by Reds around the world that our show is essential listening for them never stops being exciting; we love doing it and a big part of why we love it is because listeners use social networks to let us know what they think of each show. Actually getting out and meeting those listeners is obviously a thousand times better and we can’t wait to meet fellow fans down under. TAW Host Neil Atkinson said: “What has astonished and delighted me in equal measure doing The Anfield Wrap is the reach. The Liverpool supporting diaspora is enormous and we’re consistently overjoyed with the listeners we get from Australia. Taking the show down there to coincide with the Liverpool game excites the life out of me. The Anfield Wrap is about talking football with your mates and I’m convinced we’re going to have loads more mates once we hit Melbourne. Look forward to seeing you there lads. A merry bunch of us are heading over from New Zealand for the game. We like to talk footy, laugh and dance too so I’m sure we’ll all get on just fine! Nice one. Loving the podcast by the way. Keep up the good work – thanks for heading down to this part of the globe. Gutted to miss this by a day. Even staying in the same hotel…. A post-game wrap on the Thursday? Perchance…. doing a Sydney leg too lads? I am flying over from NZ on the 20th to sook up the atmosphere prior to the Big event and would like to purchase 2 tickets please. TAW – Please try and set up a gig in Sydney too!!! I fly into Melbourne on game day so I’ll miss your show the night before. We would also be interested in a Sydney one. Will miss the Melb event as we fly from Canberra that night. Me, my wife and 2 of our kids are coming down for the game. Any chance of a later start than 7 pm?? We are flying down from Brisbane and it will be very ,very tight to make it. I second, third and fourth the above motion to have a similar event in Sydney. Really looking forward to this as a Premier League fan, I love the podcasts from these lads. How would I go if I wore my Paul Scholes shirt to the event? Just booked tickets for Tuesday Night.